Hibs are trying to sign Genoa midfielder Stephane Omeonga on loan for the rest of the season. The Belgian 22-year-old is free to leave the Rossoblu in this transfer window after being told by manager Cesare Prandelli that he will not be in first-team plans for the remainder of the campaign. 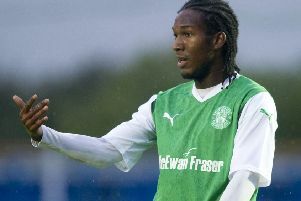 Although a deal has not been concluded yet, reports in Italy say that Omeonga has already said his goodbyes to team-mates in Genoa and is keen to join Hibs. Omeonga, who started his career at Anderlecht, has been capped five times by Belgium Under-21s. He moved from Belgium to Avellino before joining Genoa in 2017. He has made 17 in total for the northern Italian side, his last of which was on December 6 against Virtus Entella in the Coppa Italia. Hibs head coach Neil Lennon wants to strengthen his midfield in this transfer window with the Hibees currently eighth in the Ladbrokes Premiership.